This Boone Trail Highway marker has a tablet from 1927 with an image in relief of Alonzo Chapel’s 1861 illustration of Daniel Boone and his hunting dog and a modern bronze plaque attached to a lectern shaped brick and concrete display. The steel Style-3 Boone Highway tablet was primarily used between 1927 and 1938 and is distinguished by the BOONE TRAIL HIGHWAY caption being slightly curved. 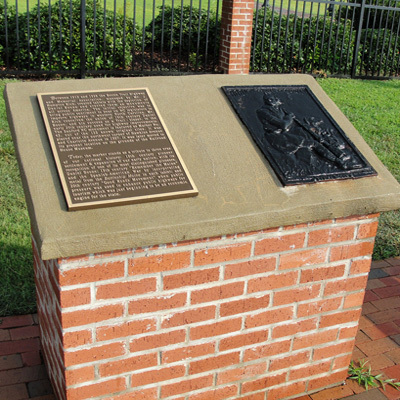 The modern bronze plaque gives the history of the Boone Trail Highway and Memorial Association and the Sanford tablet. The Boone Trail tablet was originally displayed on a stone and masonry arrowhead typical of many Boone Trail markers. The original was still in place as late as 1997. This Boone Highway marker was numbered 42 by Everett G. Marshall. His interest and research of the markers led to the book, Rich Man, Daniel Boone. The numbering system was simply the order in which he found or became aware of a marker. Modern Plaque: BETWEEN 1913 AND 1938 THE BOONE TRAIL HIGHWAY / AND MEMORIAL ASSOCIATION, MANAGED BY MR. J. / HAMPTON RICH, CREATED TABLETS WITH THE DEPICTION OF / DANIEL BOONE AND ERECTED THEM AS MONUMENTS / ALL ACROSS AMERICA. THE INITIAL OBJECTIVE WAS TO / BRING PUBLIC SENTIMENT TO BEAR ON NC LEGISLATORS TO / IMPROVE HIGHWAYS IN WESTERN NORTH CAROLINA. MR. / RICH CONCEIVED THE UNION OF 18TH CENTURY DANIEL / BOONE, AND HIS SUCCESS AS A TRAIL-BLAZER, TO THE / EARLY 20TH CENTURY NEED FOR HIGHWAY IMPROVEMENTS. / THE SANFORD NC MONUMENT IS FEATURED AS MARKER NO. / 42, OUT OF THE 135 KNOWN ORIGINAL SITES. IT WAS / PLACED NEAR THE NORTHWEST CORNER OF HAWKINS AVENUE / AND CHARLOTTE AVENUE IN 1927. IT WAS LATER MOVED TO / ITS PRESENT LOCATION ON THE GROUNDS OF THE RAILROAD / HOUSE MUSEUM. TODAY, THE MARKER STANDS AS A TRIBUTE TO THREE ERAS / OF OUR NATIONAL HISTORY: 18TH CENTURY PIONEER / SETTLEMENT & EXPANSION OF OUR EARLY NATION, WITHS ITS / RECOGNITION OF ONE OF ITS MOST DISTINGUISHED PIONEERS, / DANIEL BOONE; 19TH CENTURY “REMEMBER THE MAINE” / AND THE SPANISH AMERICAN WAR BY INCORPORATING / METAL FROM THE BATTLESHIP MAINE IN EACH TABLET; AND / 20TH CENTURY “GOOD ROADS MOVEMENT” WHEN PUBLIC / PRESSURE WAS USED TO ENHANCE PUBLIC HIGHWAYS FOR / TOURISM WHICH WAS JUST BEGINNING TO BE AN ECONOMIC / ENGINE FOR THE STATE. The marker stands near a walkway along Charlotte Ave, flanked by two benches. The first location was near Hawkins Avenue and Carthage Street, in Sanford, NC. In 1957 it was dismantled to make way for parking lot and moved to the Railroad House Historical Association Museum Grounds on Charlotte Avenue, near intersection with Hawkins Avenue.